Payment options : Credit Cards and bank transfers. Welcome to LottoPalace! The next platform in our online lottery review series. One of the best online lotto platforms around the web will bring up to you, no matter where you are, the possibility of buying raffles on the biggest jackpots draws. LottoPalace is regulated by the Curacao authorities and is available to users from all the globe, except for US players. The company is based in Malta. The site’s design is very nice, and its navigation is really simple. At Lotto Palace you will be able to find every piece of information you might need to play safely. Single buying lottery tickets and syndicates are at your disposal. Also, you will find online scratchcards, bingo, keno and slots games. If you are looking for a great experience in your lotto ticket buying, you arrive at the correct site. Welcome to LottoPalace! 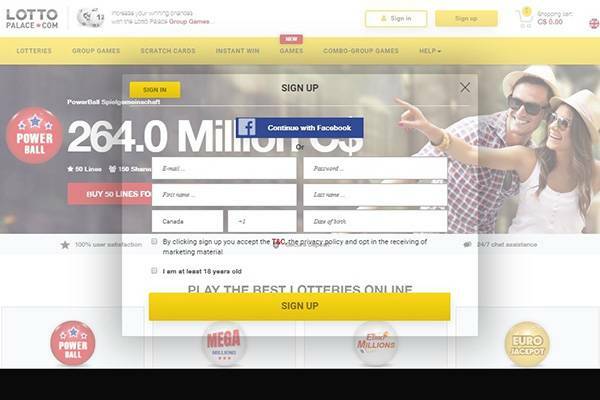 At Top10bestonlinelotto we want to provide you with the most accurate information about each online lottery brand. That’s why we take into account the main aspects to be reviewed. The security level of your data and transactions. Regulatory control of the platform activities. What are the available lotteries, side games and other relevant products for all users? Level of user experience based on the site design, navigation and offered languages. You are not always at home and most of the time we navigate with our smartphones. We checked desktop, tablet and mobile devices view and functionality. Welcome bonus offers, promotions and discounts. One of the most search features by regular players. How you can contact the customer services department and their rate of answer is crucial for every customer. LottoPalace is using the maximum level of encryption for data and transactions security: SSL 256-bit encryption. This means that your operations and personal details are safe. The brand is also under the regulatory laws of the Curacao EGaming Commission. Therefore Lotto Palace goes under deep investigation and procedures checking on a constant base. 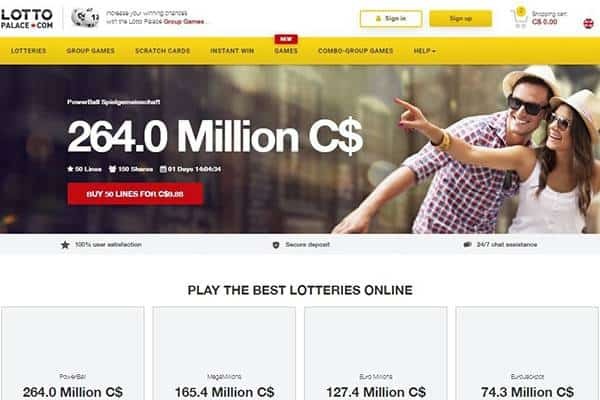 LottoPalace online lottery selection is not the widest we have seen in our reviews, but still you will find the best lotteries with the biggest jackpots. For single tickets buying, you will be find in the site the following draws: US PowerBall, Euro Millions, Mega Millions, Euro Jackpot, El Gordo de la Primitiva, Irish Lottery, OZ Lotto, German Lotto, Aussie PowerBall, UK Lotto, Bono Lotto, Austria Lotto and Sweden Lotto. The biggest absence is SuperEnaLotto, that is normally offering prizes over the hundred million dollars. If you are interest in maximizing your chances while you minimize the cost, syndicate buying is also at your disposal (named Group Games in the site). For this mode the lotteries available are: US PowerBall, Euro Millions, Mega Millions, Euro Jackpot, El Gordo de la Primitiva, Irish Lottery, German Lotto, Aussie PowerBall, UK Lotto, Bono Lotto and France Lotto. In addition, you will find 10 online scratchcards, 20 online slots and 8 instant win games (including Bingo, Keno and lotto). As you see, fun is not missing at Lotto Palace. LottoPalace has only two weaknesses. First of all is only offered in English and German. Also the payment methods available at the site are limited: Visa, MasterCard, Giropay and Sofort. If the brand improves this two points, they can achieve whatever they wish. The website design is clean and nice. Your eyes will not get tired of the screen colors and every detail is well thought. The navigation is really simple, allowing users to find lotteries, side games or any other section very quickly without performing deep searches. LottoPalace can be visit from your desktop, tablet or smartphone without loosing any functionality or user experience advantages. No matter if your smartphone runs on iOS, Android or Windows you will enjoy from the responsive theme the development department built for you. The site responsiveness means that each element of the website will be adapted to the size screen the user is navigating with. So both desktop and mobile devices are covered. As happens with every gaming site, you will get the best experience using your desktop computer. The screen size is very important to get more elements above the fold. LottoPalace responsive theme will adapt itself to the size of your screen. Tablets will enjoy from this amazing feature. All the mobile operative systems can navigate the website. Currently there is no LottoPalace apps for any device, so all the activity will take place on your browser. Currently, LottoPalace is not offering any offers for new or existing customers in relation to lottery tickets. By the way, if you choose to play online scratchcards, you will get 5% discount when buying 5 cards, and 10% discount when you buy 10. 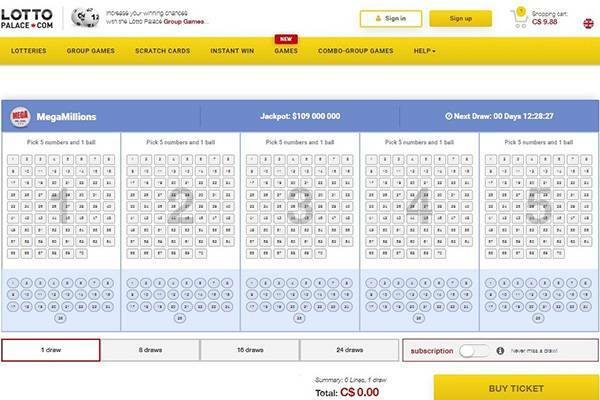 Some competitors are offering promotions on lotteries as discounts or free tickets, so Lotto Palace might need to include some offers to be more competitive. Customer service channels are not including all the existing ones, but still you will find the most popular ones. As this is one of the most important departments of any online company, we fill that telephone and contact form are missing. Live chat is available in the site. This is the most quickly way to get instant answers to any inquire you might raise. Enjoy the maximum of it on your desktop computer. You can contact the customer support team using your email. E-mail them to: support@lottopalace.com and get the answer to your question. You can write a letter the traditional way and send it to: Altair Entertainment, Dr. M.J. Hugenholtzweg Z/N UTS Gebouw, Curacao or to: Payific, 114, The Strand, Gzira GZR1027, Malta. Not very useful in our internet times, but still important to know the physical address of the brand. As soon as we landed in the site we really like it. 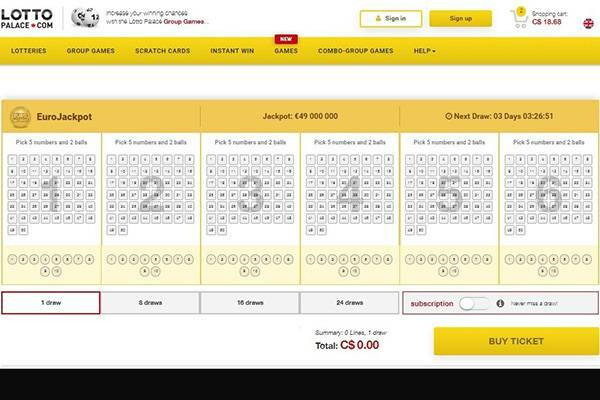 LottoPalace is offering all what we are looking for when we decided to buy online lottery tickets. 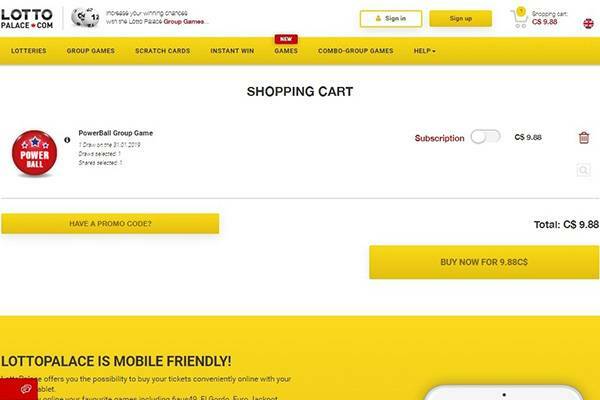 The site responsiveness, the design and user experience are top-notch. Furthermore, each lottery with an individual box explaining jackpot size and date of draw really simplifies our work. If you are an English or German speaker, Lotto Palace can be definitely your platform. Due to the customer support limited channels, the absence of promotions for lotteries and the restricted payment methods be gave to LottoPalace a rating of 4 over 5. Continue improving Lotto Palace you are in the correct path! We landed to a new platform and we want to buy a lottery raffle online, when suddenly we start asking ourselves: Is LottoPalace a scam? Will they pay my winnings? Licensed by Curacao EGaming Commission and with the highest level of encryption for data and transactions, LottoPalace is completely safe and secure. You will enjoy of a legit platform for sure! Just choose your lottery, buy your ticket and become a millionaire!